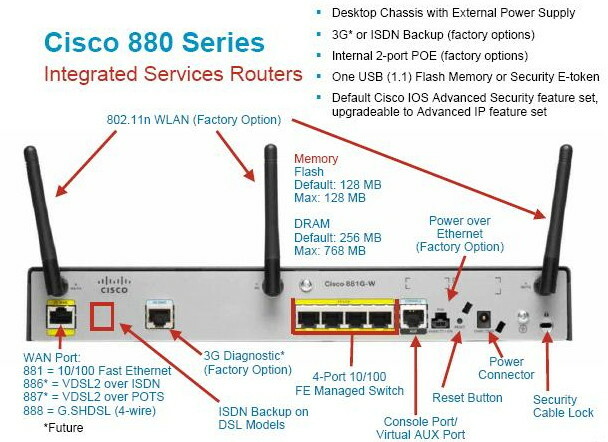 we are trying to get any info on the new Cisco 890 (not 880) series ISR routers. the problem with the 1841 it does offer a Docsis2.0 HWIC (hwic-cable-d2 & aim-ips-k9)card, but no content filtering, no 802.11n (802.11G only)and only a 10/100 switch card.. (our ISP is moving to 50mb in 12/08 and 150mb download in 2009) the memory is also very low in the 1800 series -vs- 880 series. Although the 890 hasn't yet been released, we can look to the 880 for a few possibilites. Check out the picture I attached that has the 880 on it. The Cisco 1800 series offers many more features and much better performance than the 800 series routers. I'm also fairly certain the 890 won't have any HWIC slots... the 800 series is Cisco's fixed-configuration router series. The 1800 series is modular and the 1841 supports HWICs. As far as the wireless N goes, the 880 offers this as a factory option - so we can guess the 890 will as well. The 1841 will surely support this soon with an HWIC add-on card. Regarding content security (Trend Micro) this is a feature that is licensed with IOS. With the 100/1000 card, the lowest router that supports gigabit switch modules is the 7600 series... very expensive. I don't think we can expect to see a gigabit switch module in smaller routers for a very long time. Routers are intended as edge devices now anyways... 10/100 is all that's needed. Now most people use routing switches (like the 3560, 3750, and 6500) for gigabit (core) routing. As far as IPS goes, IPS is a feature of IOS and as long as you have more 128MB or more RAM and a Adv. Sec. or higher license IPS is handled in IOS without need for an add on card. I looked in the document you attached and didn't find the word 1811w with a search. I think it's highly unlikely Cisco will replace an 1800 series device with an 800 series device... historically Cisco just doesn't do that - they always increment the series number when drastically changing a product line or features. Cheers! Let me know if you have any questions! so is performance (throughput) of the router mainly based on memory or CPU? the 1841 has a max of 384mb/128mb Flash whereas the 880 has 768mb/128mb but I'm unclear if the 880 in fact has a faster CPU being newer then the 1841? or if purchasing an 1841 now would be a risky investment given how long the item has been in service.. another idea is to have an ASA5505 act as the router on the edge for the branch office but I'm not sure it's throughput. Performance is mostly based on CPU. RAM is used for caching the image and other OS related tasks. Having a directly attached line will ALWAYS give you better performance than using a modem. As far as 802.11n on the 1841, I don't see why they wouldn't release one... (other than the product having been out so long).